It’s made with evaporated milk and contains cheese, and is just one variation of this popular sauce used with meats and vegetables. It isn’t hard to make, and doesn’t take long, but it has to be stirred the entire time. In a large saucepan, bring the water to a boil. Once it boils, dissolve the cornstarch in one can of evaporated milk, and add to the water, stirring briskly with a wire whisk. 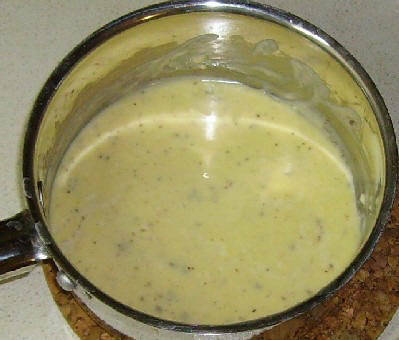 Lower the heat to medium and add the second can of milk, the salt, and shortening or butter. Continue to whisk until the sauce thickens. 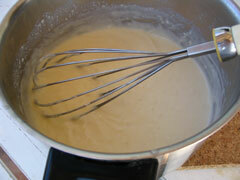 Add the beaten eggs and nutmeg, whisking very quickly (so the eggs don’t cook) until well blended. Remove from the heat, stir in the cheese, mix well and set aside, covered, until ready to use. Yield: enough for one complete 11 x 14 x 3 pan of moussaka or pastitsio (about 7 cups). 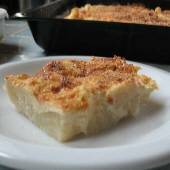 Béchamel can be refrigerated for one day (not more). It can be reheated using a double boiler (stirring constantly) or in the microwave, covered, vented, on medium power. Microwave time depends on the amount to be reheated and the microwave’s wattage, so check every couple of minutes.